There are five fantastic foxes to meet as readers search for the right one in this fun, touchy-feely book... The bright pictures, textured patches and simple, repetitive text will engage even the youngest of babies. The pictures are bold and colourful, and the text is so simple and repetitive - perfect for little ones just starting out with books and reading. The books are chunky, sturdy and very well made. The thick board pages are easy for little hands to turn. This range of books is perfect to share with wriggly toddlers. They’re bright, bold, interactive and not too long. 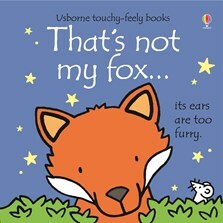 The latest addition features lots of foxes for little fingers to touch and sure to be another best-seller.